Holy Ground Explorations (HGE) was born out of a passion for Israel, for the Word of God, and for equipping others through prayer and Small Group Fellowships. How is this lived out? HGE offers a variety of experiences including first timers’ pilgrimages, hiking the Jesus Trail, working in the Land, as well as tours for those who have been to Israel but looking for a different journey. Besides leading tours, Holy Ground Explorations also provides daily Biblical devotions through our ongoing fellowship known as KFIR. Kfir is a Hebrew word meaning “Young Lions”. In addition, HGE provides a current Middle East Update posted weekly on YouTube, followed up with a printable PDF of the presentation. An important aspect of HGE is prayer. Prayer lists are sent out weekly as well as maintaining the KFIR Prayer Room located on Facebook. Perhaps what best says it all is the Mission Statement: Holy Ground Explorations is a Jesus-centered ministry devoted to equipping Believers by teaching the uncompromised Word of God, prayer, and small group fellowship, as well as supporting and exploring Israel. Dan Stolebarger has been involved in a variety of “ministry” forays since 1970, from pastoring a traditional church, planting a church, serving as an Executive Pastor at a megachurch, and has led a small group ministry consisting of over 500 groups. He served as the head of the Bible Department at a Christian high school in San Diego, as well as serving as the Athletic Director and Head Football Coach. Sharon Stolebarger is the co-founder of Holy Ground Explorations, along with her husband, Dan. Sharon has a vast resume of travel organization, having run a group tour department at a travel agency for over 13 years. Little did she know that this would prepare her for her current passion of bringing people to Israel. Jane Ben Ari is perhaps the most thorough guide in Israel, hands down. She began guiding in 1972 and has guided thousands upon thousands of people in the past 43 years. Jane has been involved with guiding Days of Discovery and participating with them in published documents concerning Israel. She has also worked with the BBC on various projects, including specials regarding the Dead Sea Scrolls. 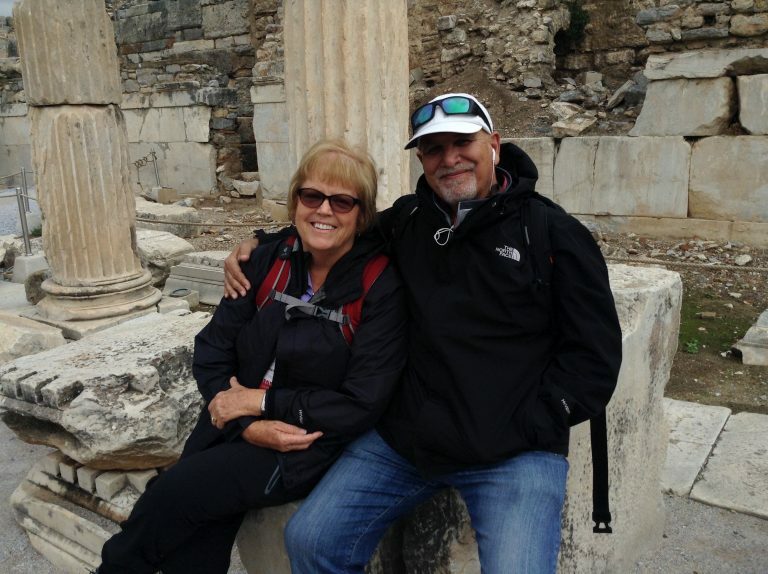 Dan and Sharon Stolebarger have led over twenty-five tours to the Holy Land and have a passion to instill a love for the Land to all who join in whatever type of journey is being offered — lives forever changed. They are very well-connected in Israel and bring the “personal” side of the Land to those journeying with them. Jane Ben Ari is perhaps the most thorough guide in Israel, hands down. She began guiding in 1972 and has guided thousands upon thousands of people in the past 43 years. Jane has been involved with guiding Days of Discovery and participating with them in published documents concerning Israel. In addition, she has worked with the BBC on various projects including children’s programs with Tony Robinson and specials regarding the Dead Sea Scrolls. Jane Ben Ari grew up in England. Following high school, she made aliyah (return to the Land), making Israel her permanent home. Jane’s passion, interestingly enough, is Nepal and she treks there almost every year, also bringing aid to the villages who live in abject poverty, although she will tell you they are the happiest people she’s ever known. Jane is even putting two Nepalese children through school — their only hope of changing their position in the caste system. Jane has three children: Yoav (Danit), a lawyer for the Dead Sea Manufacturing Co., Emmy (Tal), a psychologist living in Tel Aviv, and Kfir, her youngest, who lives in China, is a teacher, musician, jeweler, and is licensed in Oriental medicine. She has eight grandchildren. Following the Lord’s leading throughout his life has involved taking many “risks” which has led to a plethora of experiences, all leading him to this new chapter in his life. In May 2015, God birthed an exciting new ministry, Holy Ground Explorations. Dan, along with his wife, Sharon, co-founded HGE and they are excited about where this journey will lead. Dan is passionate about Israel, the Word of God, and raising up followers of Jesus. Dan and Sharon Stolebarger have been married 39 years and have been blessed with three sons, Lucas, Trevor (wife Alicia), and Jesse (wife Whitney), as well as five GRANDsons, and one Princess. Their ministry began in Chula Vista, CA, at the First Baptist Church, planting EastLake Community Church, moving on to Horizon High School under the leadership of Mike MacIntosh at Horizon Christian Fellowship. From there he was the Executive Pastor of The Rock Church San Diego before moving up to Idaho in 2005 to join the ministry of Koinonia Institute. Sharon Stolebarger is the co-founder of Holy Ground Explorations, along with her husband, Dan. Sharon has a vast resume of travel organization, having run a group tour department at a travel agency for over 13 years. Little did she know that this would prepare her for her current passion of bringing people to Israel. A vital component of the tours Sharon puts together come through the many friendships and contacts she has made over the years. HGE spends a ½ day working and serving on an IDF base (Israel Defense Force). This usually is one of the top 5 highlights for those on the tour. Whenever possible, Sharon will bring in a speaker who will address the issues facing Israel. There is a saying on these trips — “Blessed are the flexible, for they shall not break.” The itinerary becomes fluid in order to allow for inclusion of unexpected opportunities which may arise. Sharon has been a part of various ministries: Horizon Christian High School, Miles Ahead Crusades (part of The Rock Church in San Diego) and Koinonia Institute. Inevitably, each position she held ended up involving arranging for group travel. At Horizon High School, there were several trips to Hawaii for the football team. Miles Ahead Ministry included trips to Canada as well as taking 150 people to Nairobi and Uganda — the largest contingency traveling together in the history of all of Africa. Sharon and Dan have three sons, 2 daughters-in-law, and 5 GRANDsons and one Princess! She and Dan have lived in Hayden Lake, Idaho since 2005, having moved there from San Diego.